The internet is a great place to make connections, but there is no substitute for physically meeting people. The people most interested in you on social media and most likely to happily share your content are those that have actually met you. The key to social media is ‘social’. It’s far better to have a small following of interested and active people than thousands of faceless followers. Quality is always better than quantity on social media (tweet this). So how do you get to meet new people? It’s a horrible word isn’t it; networking, it feels so corporate and jargony! Take a breath, let me reassure you – it doesn’t have to be like that. Networking itself is really just about making connections (tweet this). Even if you are an introvert; connecting with other humans is part of our DNA, we just have different approaches to social interaction. 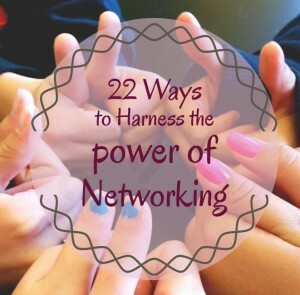 A ‘Networking Event’ is really just a room full of people all keen to meet other people. But such events are not the only way to ‘network’ – I’m now going to replace the word ‘network’ with ‘connect’ (it’s still a bit jargony I know, but it’s a nicer sounding word, it feels more inclusive and less engineered!). Anywhere you meet new people is an opportunity to makes connections. It could be; at a party, at a wedding, at a family gathering, meeting the friends of friends at a social gathering, an informal networking event, a formal networking event, at a stag/hen party, at a club meeting, at the gym, a trade fair, a business show, on a course or workshop, at a conference, a festival, a summer fete, the school gates, a street party etc. When you work for yourself, we all know that word of mouth is the most powerful way to market your business. However, having other people say nice things about you and refer people to you is far more likely to happen if they have actually met you. It can be scary striking up a conversation, but remind yourself, you are not the only person there who doesn’t know people. Even if everyone else knows each other, they don’t know you. Everyone is scared on some level about making new connections, some people are just better at camouflaging it. Until you start talking to people, you’ll never find out who is interesting and who they know. Often, it’s not the person you meet that can help you, but the people they know and unless you’ve built up a rapport, why should they let you into their inner circle? Being an introvert can actually be an advantage in a connecting situation. Introverts like their own company and every conversation is a new environment. Once they pluck up the courage to step out of their comfort zones long enough to strike up a conversation, that conversation becomes their new comfort zone and they’ll linger there, really getting to know that person and building a stronger and more satisfying relationship. Social butterflies are not necessarily good at connecting. They might meet everyone in the room and leave with a fist full of business cards but as soon as they’ve gone they’ll have forgotten who they spoke to. 1) Say yes to every invitation. Accept anything that may give you an opportunity to connect, even if it seems a bit obscure – often it’s the less obvious opportunities to connect that you meet the most interesting people. 2) When you want something, broadcast it. Tell everyone, you never know who might have the solution to your problem. Networking as about give and take – don’t just take, always be happy to share your connections and help others. Be generous with your time, your connections and your knowledge (tweet this). I really like sharing knowledge and ideas, I’m one of those freaks of nature who enjoys standing in front of an audience and sharing, I love public speaking and take every opportunity I can to do it. 3) Show up and often. Regularly attend different events, I’ve started to get to the point in the city of Bristol UK where it’s rare for me to go to an event and not know at least one other person. The more you are seen, the more likely you are to be remembered. Fear comes from uncertainty. Improve your chances by being prepared, you’ll feel more in control. Think ahead of the meeting about what you’d like to achieve. Jot your ideas down or do a mind map to get the thoughts out of your head and committed to paper, then they can start to become tangible goals. Make sure you have plenty of business cards. A notepad and pen is also handy so you can take notes if there is a speaker offering handy tips or so you can jot down the details of someone you meet who doesn’t have any business cards. Prepare a spiel for yourself. Sum up what you do in a short sentence and have answers prepared for any questions that may follow. The best piece of advice my mum ever gave me was, treat others as you’d wish them to treat you. Always be friendly and respectful, you never know when you may bump into that person again. If you go to an event with someone you know make a conscious effort not to just speak to that person the whole time. Look for people with open body language to strike up a conversation. Look for people who are on their own. The chances are they are just as scared, if not more so, than you and they’ll appreciate your company. Joining an existing conversation and listening for a wile is a good way to start to get involved and get to know people. Be yourself. You don’t have to be formal, in fact people are more likely to warm to you if you’re friendly and genuine. No one goes to a networking event to buy things, so don’t behave like a sales person. Ask lots of questions of the people you speak to and listen, don’t just wait for your turn to speak. Enjoy it! You never know what fascinating people you might meet, be bold, behave confidently, you might just surprise yourself. When you make a new connection, reinforce it by connecting with them online through; Linked In, Twitter, Facebook etc. Publicly acknowledge on social media that you enjoyed meeting them. Regularly share their content and join in with or start conversations with them online. Arrange future meetings over a coffee to catch up and possibly do business with them or pass on referral to people you think could help them. If they are not local to you, make use of tools such as Skype to ‘virtually meet’. Even when you are behind a keyboard, seeing a face is a far more human and real experience than just exchanging emails. It’s good to hear each others voices and look each other in the eye. 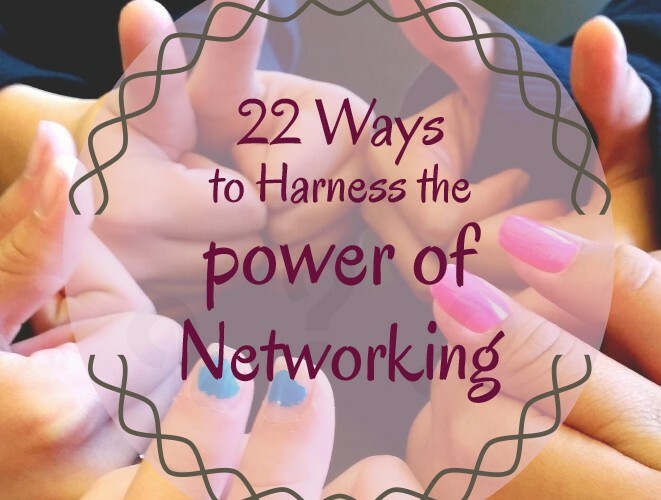 3 tips + 14 tips + 5 more = 22 things you can do to improve your chances of making valuable connections and to harness the power of networking. Hi there, just became aware of your blog through Aol, and discovered that it is really instructive. I’m gonna look out for it. I will appreciate if you continue this in future. Many individuals will be benefited from your writing. Regards!